Looking for the best TV under $500? 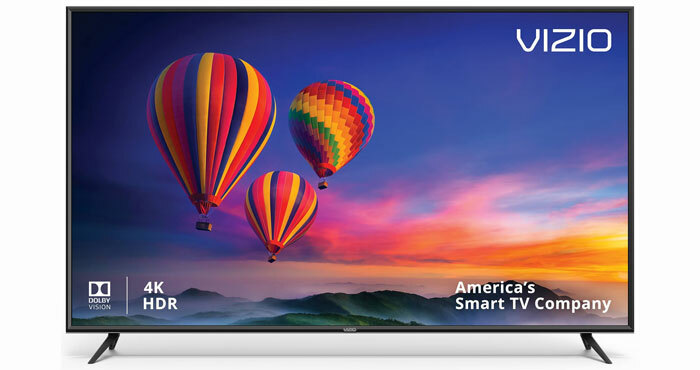 The Vizio E-Series 55E-F1 55-inch 4K UHD TV ($499.99 on TCLUSA, $458.00 on Walmart) is the way to go. 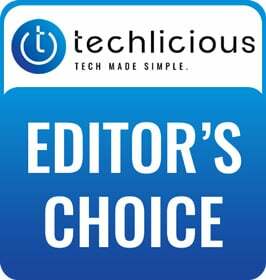 It’s the only TV in this price range to offer full-array local dimming, which gives it an advantage over the competition’s edge-lit panels when it comes to contrast, color uniformity and dark scene rendering, especially when viewed in dimly lit rooms. Plus, the Vizio E-Series supports three types of HDR – HDR 10, Dolby Vision and HGL – as well as voice control through Amazon Alexa and Google Assistant. If you have thousands to spend on a set, there's no shortage of excellent choices in a large screen TV. But that list drops significantly as you go below $1,000, and is basically non-existent below $500. In this price range, there are two brands worth considering – Vizio and TCL. TCL’s 5 Series 55S517 55-inch 4K UHD TV provides some stiff competition. In tests by Rtings.com, it out-performed the Vizio E-Series in reproducing HDR content. The TCL 5 Series is faster, with less lag than the Vizio E Series, which will make a difference to gamers. But the Vizio E Series has less perceived flicker when it comes to video games and sports. The TCL 5 Series has Roku built-in with voice control. So out of the box, you have a great streaming experience with the widest range of channel options plus the ability to pull in searchable local listings if you attach an antenna (we like the Mohu Leaf, $22.49 for a 30-mile range). The Vizio E Series has Vizio SmartCast and Chromecast built-in, which between the two support many services, including all of the major players, like Netflix, Amazon Prime Video and Hulu. There is no native voice control, but if you have an Amazon Alexa or Google Assistant device, you can control the TV and discover content. 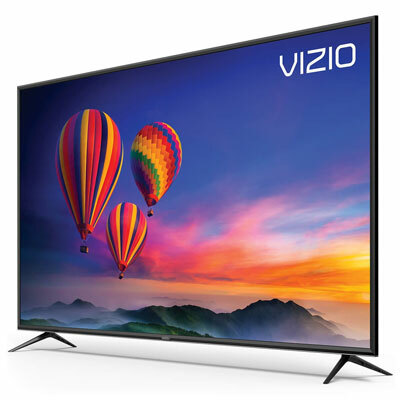 In contrast to the TCL 55S517, the Vizio E55-F1 has superior picture quality. In particular, it has better black uniformity and performance in dark rooms, thanks to its full-array panel with 10 local dimming zones. It also supports three different HDR formats – the two most popular HDR10 and Dolby Vision, plus HLG, which The TCL is edge-lit. It’s also nearly flicker-free when watching sports and playing high-frame-rate video games. CNET calls it “the best picture quality of any budget TV, period.” And Rtings.com ranks it number one in the under $500 category. Owners have also been fond of the Vizio, giving it 4.1 out of 5 stars on Walmart. Many praise the image quality and features for the price. In short, the Vizio E55-F1 offers an amazing combination of features and value, which makes it our choice for the Best TV under $500. If you're willing to spend an extra $150-$200, you can take a big step up in picture quality with the 55-inch TCL 55R617 ($649.99 on TCLUSA, check price on Amazon). The 55R617 has local dimming, like the Vizio E55-F1, but with 96 zones versus the Vizio’s 10 zones, for better picture quality. It has higher peak brightness for better viewing in bright rooms, a better motion handling for high-frame-rate video games and sports. It's widely acknowledged by reviewers as the best-quality low-cost TV on the market – just over $500. If you’re looking to spend less, go with the TCL 55S405 55-inch 4K UHD TV. It has great picture quality and Roku built-in, and at just $350 on Amazon, it’s a steal. Concerning the picture quality difference between the Vizio M43-C1 and E50-C1: granted 4K is irrelevant, more importantly the M43 has 28 active LED zones compared to 12 for the E50 and a dynamic contrast ratio of 20 million to 1 compared to 5 million to 1 for the E.
Sorry, not agreeing this story. Go to a store and compare this TV to any major brand and you won’t be buying the TCL unless you’re really strapped for cash. I reviewed what options were available from all the major brands at this price point, numerous professional reviews to build an overall consensus of the options, as well as reviews from actual owners on Amazon and other sites. While there are certainly many TVs that you can buy from major brands that will give you a better, sometimes a far better picture, there simply wasn’t anything else out there near this price point that offers anywhere near the value you get from the TCL. To get under $500 with Samsung, you would need to go with the 50” J5200. It gets lower picture quality ratings from Rtings than the TCL, doesn’t offer the Roku smart TV interface and has a smaller screen size than the TCL. It’s also not 4K, though that doesn’t really matter. Anything else worth considering would be at least $200 more. LG’s 49” UH6100 again gets slightly lower picture quality ratings, has a better smart TV system than Samsung, but still not a good as the Roku, and is a smaller display than the TCL. Though LG’s IPS displays offer better off-axis viewing than the TCL and the LG is also brighter. However, the LG 6100 is $600, putting it out of the price range. ....yes, a year later I couldn’t agree more. Whether it was the stores I was viewing them in last year or what, I went out a couple of weeks ago after seeing the review in the Wire Cutter and I was blown away. You can get better, but you’ll have to pay for it. Did you look at the Westinghouse 50” that’s selling at Best Buy for $298? I don’t know much about tvs, but that seems like a good deal - especially if you’re not a gamer or totally obsessed with extreme picture quality (honestly, a 4K and 1080p look pretty close to my eyes)? We didn’t look at that specific Westinghouse model. Checking around, I don’t see any professional reviews for it, though Westinghouse is not a highly-regarded TV brand in terms of picture quality. Reviewed.com has given previous models of Westinghouse TVs poor ratings. With the TCL, you’ll get a larger screen plus the excellent Roku smart TV features (the Westinghouse has no smart TV built-in, so you’ll need to spring additional money for a streaming device). Even at $200 more, I would opt for the TCL. And I now see the TCL on sale for only $399 on Amazon, which makes it a no-brainer over the Westinghouse. It must have been a good pick, because now, not quite a month later, the link leads one to a TCL 65US5800 65-Inch 4K Ultra HD Roku Smart LED TV (2016 Model) with the price listed as $849.99. That’s quite a difference. I tried to find the correct model number on Amazon but they only list 3rd party sellers. I guess I shouldn’t be so far behind on my reading, right? If you’re going to compare ratings on anything, you really need to make sure of who tested them for one thing. Some are better than others when it comes to testing. ALSO, and this is just as important, if not more, Testing should be done using the exact same testing “battery.” Testing with different tests or sources for the tests can skew the results. Much like manufacturer contrast levels which tend to only be equal (on the same scale and done with the same tests) within the same brand. There is also the other side of the scale too… pricing at such a level the only thing you really get is bragging rights while you sniff your cork collection. TCL can produce some high-end units, but the rest is regular Chinese hit-and-miss. (same with HiSense.) Polaroid, Westinghouse, RCA, they are but shadows of what they once were. They really only exist in name only and the quality is that of most inexpensive Chinese made stuff. The quality/consistency of the testing is vitally important, which is why only use sources that we know and trust (in many cases, we’re not only deeply familiar with the publications, we know the AV expert doing the testing, as well). For under $500, you certainly shouldn’t be expecting the latest in cutting-edge technology, but you shouldn’t get crap, either. This particular model of TCL is able to deliver quite a bit of value for the price. If you want higher quality, the TCL 55P607 (http://amzn.to/2iPBWQe) is a terrific choice, but it’s $450 more (yet still a great deal). And the Vizio M-Series also is a top performer at the lower price tier, but is over $500 for the 50” so didn’t make the cut for this article. Still, if the testers work for different places, their tests may be different, making it hard to directly compare without some reference between the two. If the tests are ran by the exact same standard set up by the publisher for multiple units, then they can be a direct comparison. But, say Brand A is tested by a Purch owned branded websites (TomsHardware/Anandtech/etc.) (and they do have good people with some solid tests for various things) and say the Brand B is a CBS/ZDNet/TechRepublic/CNet/etc. Assuming actual hands-on full testing reviews and not just the PR release on the item. Two different sources, two different sets of tests = poor comparison, regardless of how good the tests are or the people doing the testing. We try to find as many apples-to-apples comparisons as we can (e.g., Rtings has standardized testing procedures and covers a wide gamut of models). However, we don’t rely on one set of reviews precisely because we want to see how TVs perform across a range of testing procedures, and we also take into account the qualitative opinions of AV experts we know, along with owner reviews from Amazon and Best Buy (some products test great, but have issues crop up in real world situations). p.s. I go the price wrong for the P607 above - it’s actually $649 if you buy direct from Amazon. The TCL 55P605 at Best buy, $600. has top reviews all over the place. I liked the one here: https://hometheaterreview.com/tcl-55p607-uhd-ledlcd-tv-reviewed/ . Its for the 607 but the only difference I can find is it costs less and has a remote that isn’t as good as the 607. The TCL 55P605 is actually $200 more ($400 vs $600), but it is a big step up in picture quality, with true HDR. The only difference between the P605 and P607 is the remote. But I see Amazon has the P607 for $649 (http://amzn.to/2iPBWQe), and I would spend the extra $49. The upgraded remote with a headphone jack, voice search and remote finder is worth the little bit extra. What is the general consensus on the LG 49UJ6200? MSRP is around $700, but it’s been around $400 or less this Christmas. The LG 6200/6300 series is a decent entry-level 4K TV. It gets slightly lower scores on RTINGS than the TCL due to lower color accuracy and black uniformity. However, the LG does has a wider viewing angle, if that is important to you. Given the drawbacks of the LG and the smaller screen size, we still recommend the TCL. Informative article, however it only rates TVs 50’ or larger. We are interested in replacing a bedroom TV but space is limited to approx. 40”. What would be your recomendation in that size category. For a 40-inch TV, the Samsung MU7000 is widely acknowledged as the best. You’ll find it for $550 on Best Buy. The much less expensive TCL 40S305 ($250 on Amazon) is also a good option. It isn’t 4K, but at 40 inches that’s not as much an issue, and the HDR quality isn’t as good as the Samsung, but you do get Roku built-in, which is an excellent smart TV interface for streaming services, as well as over-the-air programming.